On Saturday, April 16, from 1-5pm at Bobby Riggs Tennis Club & Museum in Encinitas, Feeding America San Diego will host Pairings with a Purpose: Tapped Edition, an afternoon of culinary competition with San Diego’s finest chefs and breweries, uniting to fight hunger in San Diego. 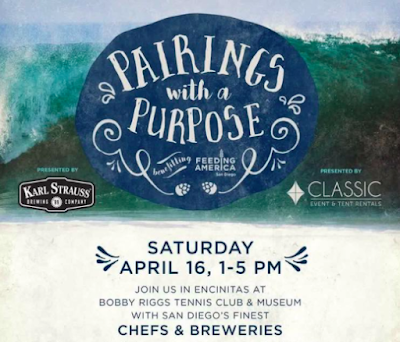 Pairings with a Purpose features Top Chefs Chad White and Brian Malarkey, as well as many other prominent San Diego chefs & breweries. We are raffling off 2 General Admission tickets to attend. Read on and be sure to enter! Olivier Bioteau of The Lodge at Torrey Pines with Bitter Brothers Brewing Co.
Shihomi Borillo of Azuki Sushi with Bitter Brothers Brewing Co.
Trey Foshee of Galaxy Taco with Benchmark Brewing Co.
Wade Haggeman of Blue Ribbon Artisan Pizzeria & The Craftsman Tavern with Second Chance Beer Co.
Katherine Humphus of Savory Made Simple with Green Flash Brewing Co.
Tim Kolanko of Stake Chophouse & Bar with Latitude 33 Brewing Co.
Miguel Valdez of The Red Door with Half Door Brewing Co.
Tickets to Pairing For A Purpose are $35 for food only (no alcohol), $45 for General Admission and $75 for VIP. Tickets include unlimited tastings, participation in voting contests and opportunities to participate in the raffle and silent auction. VIP Experience includes early admission to skip the lines, exclusive pairings, chef meet-and-greets and more. Tickets are available online. All proceeds from the event will benefit Feeding America San Diego and its critical hunger-relief and nutrition programs. Established in 2007, Feeding America San Diego (FASD) is the leading hunger-relief organization in the county, distributing 18.5 million meals within the last year, and the only Feeding America affiliate in the region. FASD provides food and resources to a network of 200 distribution partners serving 60,000 children, families and seniors each week. Focused on healthy food, education and advocacy, FASD is building a hunger-free and healthy San Diego through innovative programs and collaborative partnerships. To learn more about Feeding America San Diego and its hunger-relief initiatives, visit feedingamericasd.org.